It is simply fun to dangle on two ropes! Broadwood is a town about 25 km to the north of the north side of the Hokianga harbour, in Northland, New Zealand. Herekino is 21 km to the west, and Mangamuka Bridge is the same distance to the east. The Broadwood area was first settled by Pakeha in the 1880s, and an access road was constructed through the area from Takahue to Motukaraka on the Hokianga harbour. An unmetalled road through the Te Karae Valley to Kohukohu was constructed in 1908. 1,962 people lived on the north side of Hokianga Harbour at the time of the 2006 Census, a decrease of 54, but this is a much larger area than the town of Broadwood. There are a lot of people that are fan of suspension or swing bridges. 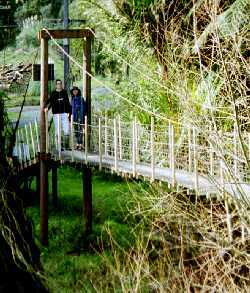 It is simply fun to dangle on two ropes, but be aware, this bridge is restricted to 4 people at a time. No messing around at all. Just in front of the bridge are public toilets and a rest area for a lunch break or a picnic.